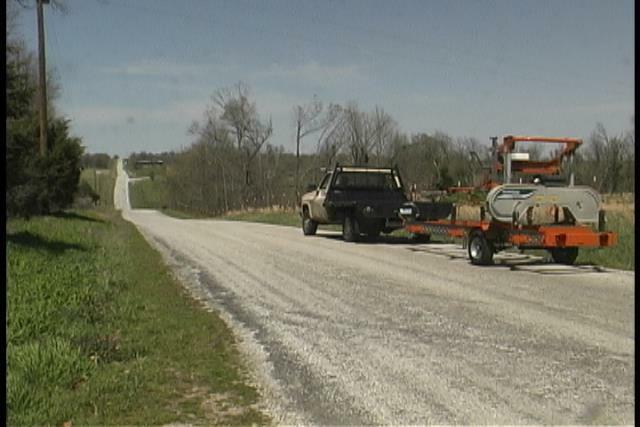 One of the great things about portable sawmills is that they’re portable! Many people build a successful business on the concept of taking the sawmill to the customer. This often makes sense, since not everyone has the means of hauling logs safely to a sawmill, and on big jobs, moving the mill can make more sense logistically. A portable sawmill service means that you do not need to have a large area to run the mill, or confine its operation to a commercially zoned area. Generally, the customer is responsible for the sawdust and slabs, too. But the best part is that you are selling the service instead of a product, so there are no inventory issues or waiting a year for wood to dry so you can sell it. Mobile sawmilling can also be a challenge, especially if long distances are involved. For example, what do you do when you have towed the sawmill sixty miles to a customer who claims to have a dozen walnut trees between 16” and 28” diameter, only to find that they are post oak, and that the customer measured the circumference (meaning they are only between 5” and 9” diameter)? What do you have to do in order to be legal? What is the best way to charge for the service? Here are some observations and tips on mobile sawmilling. First, you need to remember that you are in the business to make a profit. This means you should charge the customer based on what it costs you to do the job. Establishing a fee to transport the mill out to the customer based on mileage, plus the time to set up the mill is a good place to start. Remember, you have time invested in transporting the mill, as well as the cost. Your transport and set-up fee should be such that even a small job would be worth the trip. Let the customer determine whether the expense is worth it. I occasionally waive the setup and transport fee for large jobs. If possible, visit the customer’s location to look over the job. Some sawyers charge a small fee to cover their expense, but in any case, it can help clear up any issues and possibly save you a trip with the sawmill. If that is not practical, ask plenty of questions to make sure both you and the customer have a realistic idea of what the job involves. If the customer can email some photos of the job site and the logs, you will probably be able to determine whether the job is worthwhile. Portable sawmilling may mean working without support equipment. Be sure to find out what to expect. A front end loader and a helper with a strong back can help you make short work of a job, but you may find yourself working solo with no equipment other that what you bring. If you have to cut down trees, drag logs with your truck, buck them to length, and load them on the mill, your customer should understand that this comes at a price—if you agree to do it at all. Far better to have this understanding before you arrive with the mill. There are other understandings that you and the customer should have. For example, if you expect the customer to pay for blades that hit metal in the logs, bring that up before you hit nails. It is best to send the customer a contract that outlines all costs and expectations before you agree to take on a job. There is some debate as to how to charge customers—by the board foot, or by the hour. Charging by the board foot lets the customer know exactly what he or she is getting for the money, but charging by the hour reflects your cost, and encourages the customer to provide extra help and support equipment to get the job done as quickly and cheaply as possible. It also keeps the fee calculation as simple as possible. Once on site, remember that many people want to be “lumber jacks”, and can be over-zealous about wanting to help. Remember—YOU are in charge, and responsible for the well-being of everyone around the mill. This may mean telling people where to stand while you are sawing, when to offbear, and keeping an eye open for any unsafe activity. Mobile milling is not for everyone, but it can be a profitable part of your business if you approach it methodically.